Land mines and unexploded ordnance result in significant musculoskeletal injuries throughout the world. Landmines and more recently, IED’s (Improvised Explosive Devices), have been used extensively in every conflict since 1938. Long term placement has often resulted in death or injury to non-combatants within these high risk areas. In recent years, mines have been used increasingly as weapons of terror against local civilian populations in an attempt to isolate them or to force them from their communities by depriving them of access to farmlands, roads, and even necessities such as drinking-water and firewood. 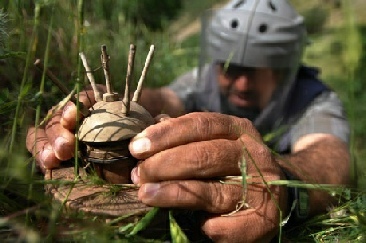 Land mines remain in effect after negotiations of a cease-fires or treaty of peace. Currently, the only way to deactivate them is by individual detection and removal. The United Nations has highlighted that even with professional training, mine disposal experts expect that for every 5000 mines cleared one worker will be killed and two workers will be injured by accidental explosions. The MQ7 approach leverages a great amount of previous research in the field of the high-energy particle physics that interact naturally in the earth’s atmosphere on a constant and global basis. This technology will then allow the user to detect, both qualitatively and quantitatively, and view the contents of wide area sub-terrain devices with accuracy, automatically pinpointing the targeted materials. MQ7 offers the most viable and practical approach to land mine & cluster munitions detection with a 100% detection capability using a new breed of passive detection technology. The MQ7 system is designed to scan and detect targeted landmines and other explosive devices. It will enable the user to de-mine one hectare in a more efficient way in maximising resource by neutralising identified devices. This means that the current blanket clearance approach using current high risk de-mining technologies and methodologies will not be required.